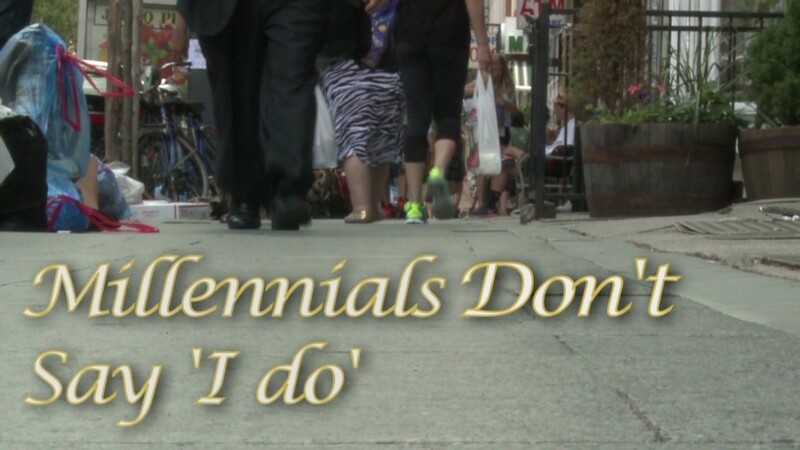 When it comes to marriage, Millennials are saying "I don't." Today's young adults are on track have the lowest rates of marriage by age 40 compared to any previous generation. If the current pace continues, more than 30% of Millennial women will remain unmarried by age 40, nearly twice the share of their Gen X counterparts, according to a recent Urban Institute report. And that could have serious economic repercussions for both the Millennials and the nation as a whole. There are several reasons behind the plunge. The importance of marriage has been diminishing for years. More Americans are living together without getting married, and some are raising families ... just without the gold bands, said Neil Howe, an economist and author of several books about Millennials. Also, marriage used to be the starting point for young adults. They got hitched early and built a life together, Howe said. Now, many people feel they have to be more established, especially financially, before they walk down the aisle. "The shift is the shift in the role of marriage in one's life," he said. Marriage rates fell even more drastically during the Great Recession, when young adults had a tough time landing their first jobs and other Americans found themselves collecting unemployment checks. Just how many Millennials tie the knot by the time they hit 40 depends on whether marriage rates return to their pre-recession levels or not. 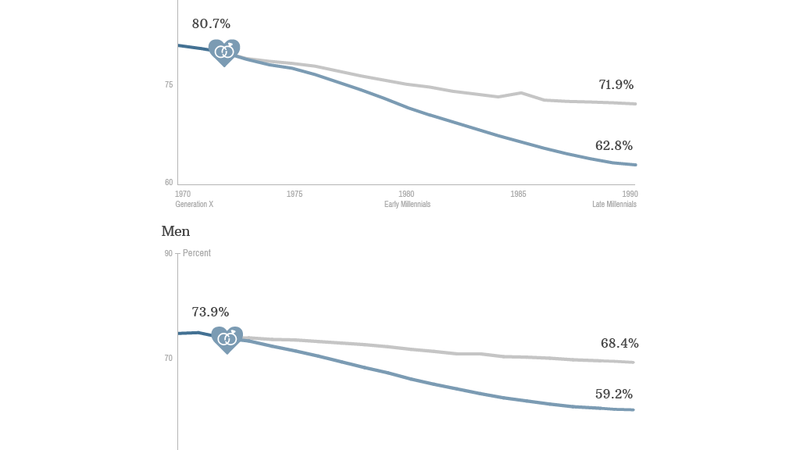 Only 69.3% of women will marry if the post-recession rate continues, while 76.8% will if the rate returns to pre-downturn levels. For men, the rates come in at 65% and 72.6%, respectively. Regardless, it will be fewer than Gen Xers. Some 82% of Gen X women and 76.6% of Gen X men were married by 40. Underlying these numbers, however, are major divisions by race and educational attainment. 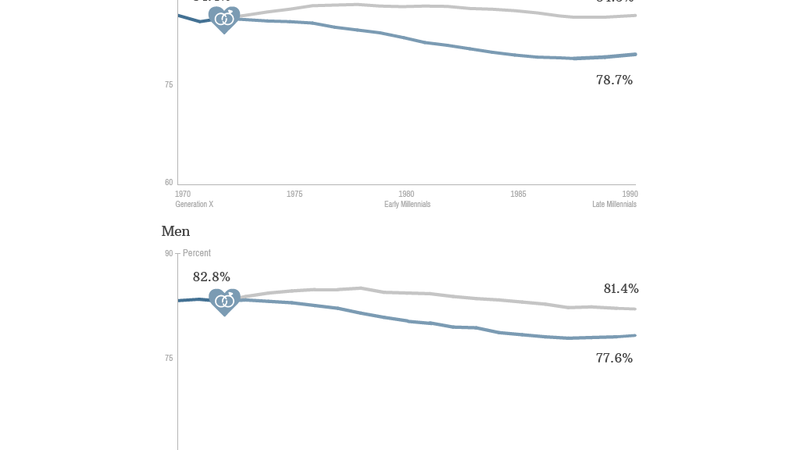 Hispanic and black Millennials, as well as those without college degrees, are expected to see greater declines in their marriage rates. White Millennials will see a small drop. College grads could remain steady if rates return or decline slightly if they don't. That runs contrary to the current narrative that Millennials are putting off marriage because of high student loan debts and unemployment rates, as well as the increased propensity to live with their parents, said Steven Martin, senior research associate at the Urban Institute and the report's co-author. He found, however, that college graduates marry later so they are better able to ride out poor economic times just after they finish school. And staying single while young gives them more opportunity to establish a financial base since they can focus on their careers. But the explosion in singles has its downsides. Married couples are often better off financially, which means they can spend more. "The evidence shows that getting married increases wealth and income," said Pamela Smock, a sociology professor at the University of Michigan. Single Americans may be less likely to buy homes or trade up to accommodate growing families, while single parents may be more likely to qualify for government safety net programs. And the growing schism in marriage rates could exacerbate income inequality in this country, dividing society into still mostly married "haves" and increasingly single "have nots."